The Brexit deal breakthrough finally hits the wires to support Sterling to conquer 1.3000 after falling to an 11-week low of 1.2698 earlier. The Bank of England Governor Mark Carney repeatedly said that no-deal Brexit is not the most likely scenario. The Bank of England slightly downgraded the short-term growth outlook while sticking to one rate a year outlook for monetary policy. After a strong October US labor market report, the probability of Fed hiking rates in December rose to 81% according to the Fed watch tool. The death cross of a 50-day moving average and a 100-day moving average is needed to confirm the trend reversal on a daily chart. FXStreet Forecast Poll turned bearish for Sterling for the second week of November, but with the break above 1.3000, the directional move is to the upside targeting 1.3060-1.3100. While Sterling fell to the lowest level since mid-August over the course of the first week of November, the news of the UK completing a deal on financial services with the EU boosted Sterling to jump strongly above the psychological level of 1.3000 to reach last week’s high of 1.3042. Since the October Brexit summit failure, the UK macroeconomic fundamentals have a much lower influence of the direction of the FX rate of Sterling with Brexit headlines winning it all. The same applied to currency movement over the first week of November. While GBP/USD fell from Monday open at 1.2826 as low as 1.2698 on Wednesday, the news of the UK Brexit Secretary Dominic Raab saying that Brexit deal will be delivered until the end of November, boosted Sterling to cross over the downward trendline resistance. Further rumors of the UK government signing the financial services with the European Union early on Thursday saw sterling rise almost 2% to 1.3000. 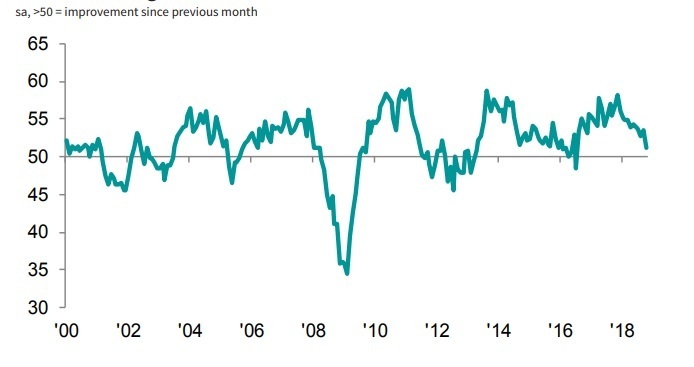 On the macro front, the UK manufacturing sector PMI fell to 51.1 in October, down from a revised 53.6 in September as new orders and employment sub-indices of the PMI both declined for the first time in 27 months. The Bank of England November Inflation Report was the most important event of last week, with the outcome of the Bank keeping the Bank rate and the asset purchasing program unchanged while the Bank of England Governor Mark Carney repeatedly said the no-deal Brexit is a highly unlikely scenario. The Bank of England officials stressed that they are ready to act whatever the Brexit deal outcome to make sure the policy target, the inflation, returns to normal of 2%. While the Bank of England lowered the short-term growth forecast, the policy outlook unchanged with a one-rake-hike-a-year policy. On the other side of the Atlantic, the US saw a remarkable labor market report for October. The number of new jobs added in October surprised on the upside with 250K jobs compared with 190K expected by the market. Even with a downward revision to 118K for September, the combination of wage growth of 3.1% y/y in October, the highest since May 2009, sets Fed for the additional rate hike in December. The Federal Open Market Committee is scheduled to meet next Thursday, but the rate hike is set to materialize in December with the Fed funds futures indicating 81% chance of Fed rate hike to 2.25%-2.50% at December 18-19 policy meeting. The CME group's Fed watch also implies 56% chance of Fed raising rates to 2.50%-2.75% at March 19-20 2019 policy meeting. The GBP/USD daily chart implies that Sterling is still capped in a downward sloping trend. The currency pair leaped off 11-week low of 1.2698 towards a 50-day and a 100-day moving average that now serves as an active resistance, but needs to move higher to see a 50-day moving average crossing a 100-day moving average. With break above psychological 1.3000 level, the directional move based on the technical oscillators is upwards towards 1.3100 level representing 38.2% Fibonacci retracement of the 2018 high of 1.4377 to this year’s low of 1.2662. A death cross of a 50-day moving average and a 100-day moving average is needed to confirm the trend reversal. Given the speed of Sterling’s current appreciation, the immediate directional movement on Sterling should be on the downside with retracement towards 1.2950. This scenario is supported by the fall of technical oscillators like the Relative Strength Index and Slow Stochastics downwards from the overbought territory. Although correction might see GBP/USD retreating to 1.2950 near term, the ultimate target in a corrective move lays at 1.3060 representing 23.6% Fibonacci retracement of Sterling falling from 2018 high of 1.4377 to 2018 low of 1.2662. 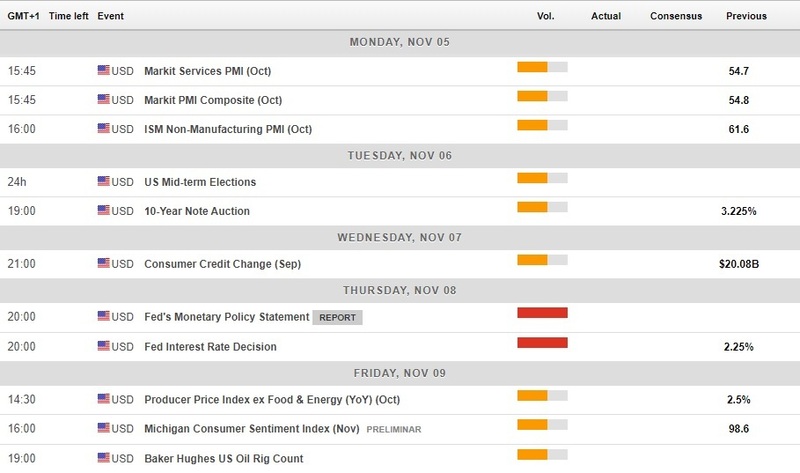 During the second week of November, the major market event is on Thursday with the Federal Open Market Committee (FOMC) meeting. Although no rate hike is expected in November, the FOMC is expected to stick to the script and confirm that the recent labor market strength including solid wage growth set the course for December rate hike. In fact, the chances of Fed raising rates in December to 2.25%-2.50% increased to 81% according to CME’s Fedwatch. The same tool also implies 56% chance of Fed raising rates to 2.50%-2.75% at March 19-20 2019 policy meeting. Apart from that, the US ISM purchasing manager index (PMI) in services is expected to follow the suit of the manufacturing PMI and to decelerate to 60.0 in October. In the UK Brexit remain the most important topic with unscheduled headlines expected to drive the market at any moment, including the weekend. Looking at the fundamental, the UK will see the manufacturing output and the GDP report published next Friday. After the November Inflation Report out last week, the macro data are unlikely to change the present course of monetary policy of the Bank of England that said it will stick to a one rate hike a year plan. The FXStreet Forecast Poll estimated the FX spot rate for GBP/USD at 1.2810 this Friday, with reality much more positive for Sterling at 1.2990. For the second week of November, the FXStreet Forecast Poll see the spot to reach 1.2938 with 50% bearish, 43% bullish and 7% sideways trend forecasters. The share of bearish forecasts dropped to 50% compared with 53% last week and 92% of bearish forecasts two weeks ago. The bullish-to-bearish distribution now reflects the increased probability of no-deal Brexit being the marginal scenario as indicated by the Bank of England officials during the November Inflation Report press conference. Forecasts for 1-month ahead expect 1.2898 with the share of the bearish forecasts increasing from 33% to 58% and bullish forecast dropping to 42%. The FXStreet Forecast Poll remained prevailingly bullish for 3-month time expecting 1.2986, virtually unchanged from last week's 1.2989, down from the forecast of 1.3037 expected two weeks ago. The share of bearish forecast rose to 38% from last week's 30% compared with the drop in the bullish forecast to 43% this week and 57% of bullish forecasts last week.